Just outside of the town's market area is Wat Phra Singh. The temple was built in the fourteenth century, about 100 years after the city's founding. 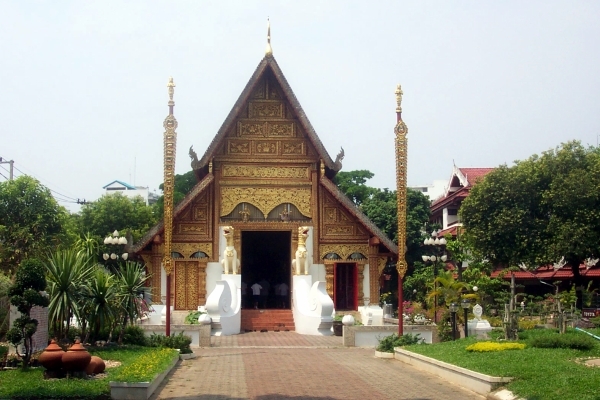 Its wiharn once held the Phra Singh Buddha image which now resides in a temple of the same name in Chiang Mai. The image inside the chapel here is a copy. Near the eastern entrance to the temple is a rather large sign which attempts to explain the history of the Phra Singh image, but it soon descends into gibberish and isn't very useful. The beautiful wiharn (prayer hall) is extensively decorated inside and out. The hall was built in the 1890s, but some of the decoration, such as the doors, are actually quite modern. Behind the wiharn is a rather plain chedi (pagoda) that has been recently painted completely gold. Near this is one particularly spectacular specimen of the cannonball tree, which is commonly found in several temples around Chiang Rai. The tree gets its name from the grape-like buds which sprout from the tree's trunk. These round hard buds burst into odd spiky flowers one-by-one, and these in turn form large hard fruits the size of a cannonball. The carved 'tung' flags in front of the chapel, as well as the gates, feature a sequence of animals from the Thai/Chinese astrological signs.